Vladimir Keilis-Borok, a UCLA seismologist and mathematical geophysicist who, along with his research team, developed a method intended to predict earthquakes months in advance, died Oct. 19 in Culver City, Calif., after a long illness. He was 92. Keilis-Borok worked with other experts in pattern recognition, geodynamics, seismology, chaos theory, statistical physics and public safety to develop algorithms to detect precursory earthquake patterns. In June 2003, the team predicted that an earthquake of magnitude 7 or higher would hit Japan in a region that included the island of Hokkaido by Dec. 28. On Sept. 25, approximately three months after it was predicted, a magnitude 8.1 quake struck Hokkaido. "Earthquake prediction is called the Holy Grail of earthquake science and has been considered impossible by many scientists. It's not impossible," Keilis-Borok said in a UCLA press release issued in January 2004. At the time, he was a professor at the UCLA Institute of Geophysics and Planetary Physics and UCLA's Department of Earth and Space Sciences. He also used his mathematical theories to accurately predict the winner of the popular vote in each U.S. presidential election from 1984 to 2008 and even applied his techniques to predict murder-rate trends in Los Angeles, recessions and the unemployment rate. 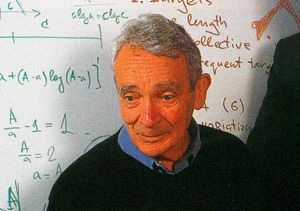 Keilis-Borok, who received his doctorate in mathematical geophysics from the Academy of Sciences in Moscow, began his career at UCLA in 1998 as a Regents' Professor. He retired from the faculty in 2010. He was elected to membership in seven international academies of science, including the American Academy of Arts and Sciences (1969), the Austrian Academy of Sciences (1992), the U.S. National Academy Sciences (1971), the Pontifical Academy of Sciences (1994), the Russian Academy of Sciences (1988), Academia Europaea (1999) and the Royal Astronomical Society (1989). He was awarded the inaugural Lewis Fry Richardson Medal by the European Geophysical Society for his exceptional contributions to non-linear geophysics. He was also founding director of the International Institute of Earthquake Prediction Theory and Mathematical Geophysics and served as president of the International Union of Geodesy and Geophysics from 1987 to 1991. "Volodya," as he was known by those close to him, "will be remembered by his family, friends and colleagues around the world as a great man, scientist and teacher," said his friend Alik Ismail-Zadeh, a researcher at the Karlsruhe Institute of Technology in Germany.